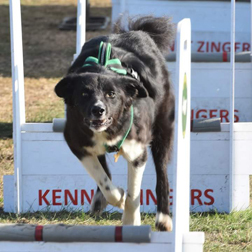 The Kennet Flyball Club (KFC) was formed in summer of 2008 to allow dogs and their humans to participate in one of the country's fastest growing dog sports. 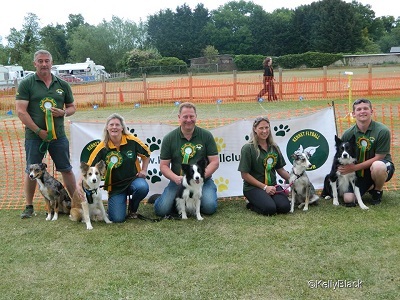 Based just south of Reading, Berkshire we currently have teams competing in British Flyball Association (BFA) Sanctioned Competitions and a Starters Team. Our Teams are the Kennet Zingers, Kites, Kestrels. We are always looking to put new teams together and we welcome new members. Both starters and open dogs training on a Sunday morning, at Padworth Village Hall, Padworth Lane. RG7 4HY. We try to promote a relaxed environment where dogs and humans can have fun, but at the same time we aim to establish competitive teams for competition. All the teams have been reasonably successful in competitions and often finish well placed in their respective divisions, the Zingers race in the top divisions 1 or 2 with the Kites snapping at their heels. As all teams are seeded according to speed they compete with their equals which gives them close competitive racing in all divisions. If you like the sound of Flyball then why not come to one of our Training Sessions. We train at Padworth Village Hall, Padworth Lane RG7 4HY Starter training classes are on a Sunday morings, set up from 9:00 AM (help setting up and taking down is much appreciated) to start training by 9:30 AM. Check the website first for training session announcements. Get your human to contact our humans by filling out the form on the Contact Us page. We look forward to hearing from you. Ruth has made amazing progress with Jet this winter, especially this past month. Jets always been a nice consistent flyball dog, but he's often had problems remebering he has four legs and not three. After retraining his box turn this winter period, jet is now consistently hitting the box with all four feet and all that hard work Ruth puts in is really paying off. We have 3 Open flyball teams and a Starter team. Why not join our club and train your human!